It’s Sanrio! And you get two games in one cartridge! Such a deal. Er, you’re Tabo, and you run around avoiding ghosts and stuff. Tabo’s cool because his mouth is perpetually open. Hell yeah! And on occasion he even opens his eyes! How awesome is that? In the Card game, he just runs around flipping cards that match, like Memory or Concentration or something. 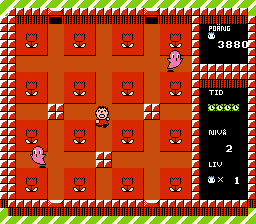 The Cube game is just weird, because you’re sort of shifting rows of blocks to line up blocks of the same type. Trust me, it makes a lot more sense when you play it. So play it! 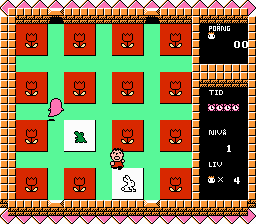 This is a Swedish translation of Minna no Taabou no Nakayoshi Daisakusen for the NES. 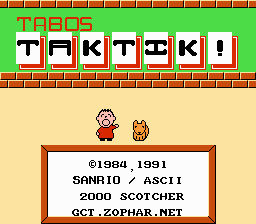 This translation is based on Suicidal Translations’s English translation but the patch should be used with the Japanese ROM.